The Urban. 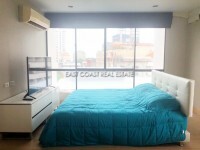 Located right in the heart of Pattaya City this condominimum development has easy access to shopping malls, nightlife, restaurants, all local amenities and public transportation. This large 2 bedroom unit is offered for rent fully furnished with laminate flooring throughout, fitted Western kitchen, one en-suite bathroom with walk in shower, and air conditioning throughout. It also comes equipped with free Cable TV and WIFI connection. The development has 24 hour security, 2 communal swimming pools, gymnasium, on-site laundry, reception, steam and games rooms and covered car parking. 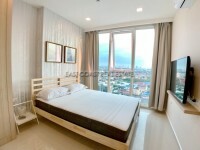 Available with 6 month contract at 32,000 Baht with 2 month deposit. Also for SALE at 5,500,000 THB in foreign quota with 50/50 on transfer fee & taxes.